Syrian state TV says about 400 civilians were massacred since Wednesday. Other reports say most of the victims were Shabiha militiamen. 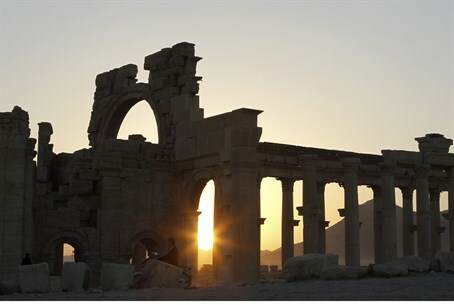 The Islamic State (aka ISIS) group has reportedly murdered hundreds of people after seizing the ancient town of Palmyra (Tadmor) last week. The organization seized full control of the town Wednesday. Syrian state TV has reported that about 400 civilians were massacred by the group since Wednesday, while activists in Palmyra said that ISIS fighters hunted down President Bashar al-Assad's troops and loyalists, killing up to 300 of them. Nasser, of the Palmyra Media Center – a monitoring group on the ground – told Al Jazeera that most of those murdered were Syrian government troops captured by the fighters after taking over the town. "Shabiha (a term used to describe a state-sponsored militia), including men and women, were the ones targeted and killed," he said. Meanwhile, the Syrian military is deploying troops in areas near Palmyra in an apparent preparation for a counter-attack to retake it. Talal Barazi, the governor of the central province of Homs, which includes Palmyra, confirmed to the Associated Press on Sunday that government forces intend to launch a counter-attack. "There are plans, but we don't know when the zero hour for a military act in Palmyra [sic]," Barazi said. The capture of Palmyra has stoked fears that ISIS might try to destroy the well-preserved, 2,000-year-old Roman-era city on the town's edge – as they have destroyed other archaeological treasures in Syria and Iraq.